Material waste is unfortunately a very common problem in manufacturing lines and often results in higher overall costs to the manufacturer. Think about your own lines. Do you have stub rolls or piles of wasted tape laying around? Tape waste can be attributed to choosing the wrong packaging tape, as well as improper application of tape – and the costs associated can add up. Selecting the wrong type of packaging tape for your application can result in poor adhesion, causing cartons to become unsealed and require re-sealing, thus needing a second strip of tape that should not be necessary. In some cases, a thicker tape is used than is needed for the job in order to compensate for the adhesion that is lacking due to inadequate wipe-down in application. Manufacturers often “go wrong” when choosing a grade, a type of adhesive, or not considering their sealing environment. Factors like heavy content, cold environments or sealing recycled cartons are critical to keep in mind when selecting a tape. Waste also commonly occurs from using a tape that is not “good to the core,” or leaves behind several inches – or more – of unusable tape at the end of the roll. This occurs because tape tends to “break out” of the during application as the roll gets smaller, leaving it unusable. 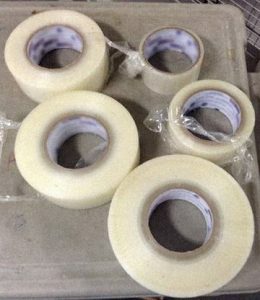 Tape waste can also be caused by improper application, even if the right tape for the job is used. Packaging tapes are pressure-sensitive, which means that a certain amount of force is needed to bond the adhesive in the tape with the corrugated surface to which it is applied. This force allows the tape’s adhesive to embed with the fibers of the carton and create a permanent bond. Without proper wipe-down pressure, carton seals lack security and have a higher chance of failing, leading to labor losses needed to track down the inadequately sealed cartons and material waste from the application of additional strips of tape to reseal the carton. Another issue related to improper tape application is using too much tape on the carton and having tab lengths that are too long. With proper application, secure seals should only require one strip of tape. Tab lengths can also be adjusted up or down based on factors such as carton weight and contents.